Q: Was Diên Bin Phû a conventional military victory or was it a victory for military warfare? 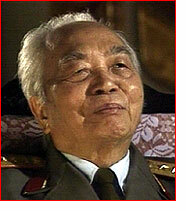 Giap: The victory at Diên Bin Phû was a victory for the people. But then, of course, while the concept of a people's war and guerrilla warfare are not entirely separate, they are separate nonetheless. In this case, it was the people's war that was victorious. And guerrilla warfare was one aspect of that people's war. It's all quite complicated.... What is the people's war? Well, in a word, it's a war fought for the people by the people, whereas guerrilla warfare is simply a combat method. The people's war is more global in concept. It's a synthesized concept. A war which is simultaneously military, economic and political, and is what we in France would call "synthesized." There's guerrilla warfare and there's large-scale tactical warfare, fought by large units. Q: What was new about the idea of the "People's War"? Giap: It was a war for the people by the people. FOR the people because the war's goals are the people's goals -- goals such as independence, a unified country, and the happiness of its people.... And BY the people -- well that means ordinary people -- not just the army but all people. We know it's the human factor, and not material resources, which decide the outcome of war. That's why our people's war, led by Ho Chi Minh, was on such a large scale. It took in the whole population. Q: What do you think about the significance of Diên Bin Phû for the world? Giap: The history of the Vietnamese people goes back thousands of years. During that time we've repelled thousands of invaders. Only, in former times the countries that tried to invade us were on the same economic level as we were. Theirs, like ours, was a feudal society. That was the case, for example, when we fought the Chinese in the 13th century. But Diên Bin Phû was a victory in another era. What I mean is that in the latter half of the 19th century, when western imperialism divided the world into colonies, a new problem emerged. How could a weak, economically backwards people ever hope to regain its freedom? How could it hope to take on a modern western army, backed by the resources of a modern capitalist state? And that's why it took us 100 years to fight off the French and French imperialism. Diên Bin Phû was the first great decisive victory after 100 years of war against French imperialism and U.S. interventionism. That victory that put an end to the war and marked the end of French aggression. From an international point of view, it was the first great victory for a weak, colonized people struggling against the full strength of modern Western forces. This is why it was the first great defeat for the West. It shook the foundations of colonialism and called on people to fight for their freedom -- it was the beginning of international civilization. Q: Was Diên Bin Phû an easy victory because the French made so many mistakes? Giap: It's not as simple as that. We believed that in the French camp, French general staff and the military chiefs were well informed. They'd weighed up the pros and cons, and according to their forecasts, Diên Bin Phû was impregnable. It has to be said that at the beginning of the autumn of '53, for example, when our political headquarters were planning our autumn and winter campaigns, there was no mention of Diên Bin Phû. Why? Because, the Navarre plan didn't mention it either. They had a whole series of maneuvers planned. For us, the problem was that Navarre wanted to retain the initiative whereas we wanted to seize it. There is a contradiction that exists in a war of aggression whereby you have to disperse your forces to occupy a territory but rally your mobile forces for offensive action. We took advantage of this contradiction and forced Navarre to disperse his forces. That's how it all started. We ordered our troops to advance in a number of directions, directions of key importance to the enemy although their presence wasn't significant. So the enemy had no choice but to disperse their troops. We sent divisions north, northwest, toward the center, towards Laos; other divisions went in other directions. So to safeguard Laos and the northwest, Navarre had to parachute troops into Diên Bin Phû, and that's what happened at Diên Bin Phû. Before then, no one had heard of Diên Bin Phû. But afterwards, well that's history, isn't it? French General Staff only planned to parachute in sufficient troops to stop us advancing on the northwest and Laos. Little by little, they planned to transform Diên Bin Phû into an enormous concentration camp, a fortified camp, the most powerful in Indochina. They planned to draw our forces, break us, crush us, but the opposite took place. They'd wanted a decisive battle and that's exactly what they got at Diên Bin Phû -- except that it was decisive for the Vietnamese and not for the French. Q: Before Diên Bin Phû, do you think the French ever imagined you could defeat them? Giap: Well, everyone at Diên Bin Phû, from the French generals and representatives of the French government to the American generals and the commanding admiral of the Pacific Fleet, agreed that Diên Bin Phû was impregnable. Everyone agreed that it was impossible to take. The French and then the Americans underestimated our strength. They had better weapons and enormous military and economic potential. They never doubted that victory would be theirs. And yet, just when the French believed themselves to be on the verge of victory, everything collapsed around them. The same happened to the Americans in the Spring of '65. Just when Washington was about to proclaim victory in the South, the Americans saw their expectations crumble. Why? Because it wasn't just an army they were up against but an entire people -- an entire people. So the lesson is that however great the military and economic potential of your adversary, it will never be great enough to defeat a people united in the struggle for their fundamental rights. That's what we've learned from all this. Q: Why was the National Liberation Front so successful in expanding the areas it controlled between 1960 and 1965? Giap: Throughout our long history, whenever we've felt ourselves to be threatened by the enemy, our people have closed in the ranks. Millions of men, united, have called for "Unification above all," for "Victory above all".... The National Liberation Front was victorious because it managed to unite most of the people and because its politics were just. Q: Did you change your tactics at all when the American troops began to arrive after 1965? Giap: Of course, but even so, it was still a people's war. And, a people's war is characterized by a strategy that is more than simply military. There's always a synthesized aspect to the strategy, too. Our strategy was at once military, political, economic, and diplomatic, although it was the military component which was the most important one. In a time of war, you have to take your lead from the enemy. You have to know your enemy well. When your enemy changes his strategy or tactics, you have to do the same. In every war, a strategy is always made up of a number of tactics that are considered to be of great strategic importance, so you have to try to smash those tactics. If we took on the cavalry, for example, we'd do everything we could to smash that particular tactic. It was the same when the enemy made use of strategic weapons.... And, when the Americans tried to apply their "seek and destroy" tactic, we responded with our own particular tactic that was to make their objective unattainable and destroy them instead. We had to...force the enemy to fight the way we wanted them to fight. We had to force the enemy to fight on unfamiliar territory. Q: Was your Têt offensive in 1968 a failure? Giap: As far as we're concerned, there's no such thing as a purely military strategy. So it would be wrong to speak of Têt in purely military terms. The offensive was three things at the same time: military, political, and diplomatic. The goal of the war was de-escalation. We were looking to de-escalate the war. Thus, it would have been impossible to separate our political strategy from our military strategy. The truth is that we saw things in their entirety and knew that in the end, we had to de-escalate the war. At that point, the goal of the offensive was to try to de-escalate the war. Q: And did the de-escalation succeed? We did this by confronting them with repeated military, as well as political and diplomatic victories. By bringing the war to practically all the occupied towns, we aimed to show the Americans and the American people that it would be impossible for them to continue with the war. Essentially, that's how we did it. Q: You are familiar with those famous pictures of April 1975, of American helicopters flying away from the American Embassy. What do those pictures mean to you? Giap: It was as we expected. It marked the end of the American neo-colonial presence in our country. And, it proved that when a people are united in their fight for freedom, they will always be victorious. When I was young, I had a dream that one day I'd see my country free and united. That day, my dream came true. When the political bureau reunited Hanoi with Laos, there were first reports of evacuation. Then the Saigon government capitulated. It was like turning the page on a chapter of history. The streets in Hanoi were full of people. The pictures of the helicopters were, in one way, a concrete symbol of the victory of the People's war against American aggression. But, looked at another way, it's proof that the Pentagon could not possibly predict what would happen. It revealed the sheer impossibility for the Americans to forecast the outcome. Otherwise, they would have planned things better, wouldn't they. The reality of history teaches us that not even the most powerful economic and military force can overcome a resistance of a united people, a people united in their struggle for their international rights. There is a limit to power. I think the Americans and great superpowers would do well to remember that while their power may be great, it is inevitably limited.... Since the beginning of time, whether in a socialist or a capitalist country, the things you do in the interests of the people stand you in good stead, while those which go against the interest of the people will eventually turn against you. History bears out what I say. Q: Who invented the idea of People's war? Whose idea was it originally? Giap: It was originally a product of the creative spirit of the people. Let me tell you the legend of Phu Dong...which everyone here knows well. It's a legend set in prehistoric times. The enemy was set to invade, and there was a three-year-old boy called Phu Dong who was growing visibly bigger by the minute. He climbed on to an iron horse and, brandishing bamboo canes as weapons, rallied the people. The peasants, the fisherman, everyone answered his call, and they won the war. It's just a legend and like popular literature, the content is legendary, but it still reflects the essence of the people's thinking. So, popular warfare existed even in legends, and it remained with us over the centuries. Q: Why do you think Vietnam is almost the only country in the world that has defeated America? Why only Vietnam? Giap: Speaking as a historian, I'd say that Vietnam is rare. As a nation, Vietnam was formed very early on. It is said that, in theory, a nation can only be formed after the arrival of Capitalism -- according to Stalin's theory of the formation of nations, for instance. But, our nation was formed very early, before the Christian era. Why? Because the risk of aggression from outside forces led all the various tribes to band together. And then there was the constant battle against the elements, against the harsh winter conditions that prevail here. In our legends, this struggle against the elements is seen as a unifying factor, a force for national cohesion. This, combined with the constant risk of invasion, made for greater cohesion and created a tradition -- a tradition that gave us strength. The Vietnamese people in general tend to be optimistic. Why? Because they've been facing up to vicissitudes for thousands of years, and for thousands of years they've been overcoming them. Q: What was the contribution of Marxism and Leninism to your theory of a People's War? The People's War in Vietnam pre-dated the arrival of Marxism and Leninism, both of which contributed something when they did arrive, of course. When the USSR collapsed, we predicted that 60 to 80 percent of our imports and exports budget would be eliminated because we depended upon aid from the USSR and other socialist countries. So people predicted the collapse of Vietnam. Well, we're still hanging on and slowly making progress. I was asked what I thought of Perestroika, so I answered that I agreed with the change and thought it was necessary in political relations. But Perestroika is a Russian word, made for the Russians. Here we do things the Vietnamese way. And we make the most of our hopes and the hopes of those in Russia, China, the USA, Japan, Great Britain -- but we try to assimilate them all. As I mentioned, the Vietnamese people have an independent spirit, stubborn people, I suppose, who do things the Vietnamese way. So now the plan is to mobilize the entire population in the fight against backwardness and misery. While there are the problems of war and the problems of peace, there are also concrete laws, social laws, great laws, which retain their value whether in peace or war. You have to be realistic. You have to have a goal. You have to be a realist and use reality as a means of analyzing the object laws which govern things. To win, you have to act according to these laws. If you do the opposite, you're being subjective and you're bound to lose. So, we learn from the experience, both good and bad, of Capitalism. But, we have our own Vietnamese idea on things. I'd like to add that we are still for independence, that we still follow the path shown us by Ho Chi Minh, the path of independence and Socialism. I'm still a Socialist but what is Socialism? It's independence and unity for the country. It's the freedom and well-being of the people who live there. And, it's peace and friendship between all men.